Breyer spoke today at APA’s 2016 Annual Meeting in Atlanta about his latest book, The Court and the World: American Law and the New Global Realities. His comments on the book were in response to a question from friend and past APA President Alan Stone, M.D., who was instrumental in bringing Breyer to the APA meeting. From there, court decisions can be appealed—many times—through district and circuit courts, state supreme courts or federal appeals courts until they come to the Supreme Court. Some 7,000 to 8,000 cases a year request hearings before the Supreme Court, and only some 80 cases are heard. “The criterion for whether cases get heard by the court is whether there is a division of opinion in the lower courts,” Breyer said. That is, the court primarily takes cases to resolve a conflict among the lower appeals courts on an important question of federal law. 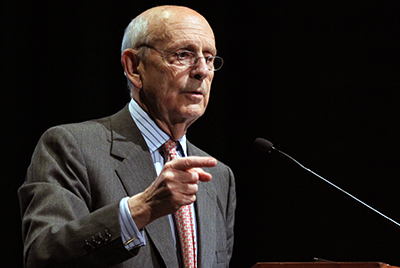 Breyer said the orderliness of the court, along with its processes, is one of the great achievements of the United States. He noted that some highly controversial decisions by the court may have had large segments of the population angry or even furious (he cited, for instance, the 2000 case in which court’s decision effectively decided the contested 2000 presidential election). Copyright © 2016 American Psychiatric Association. All rights reserved.